Pizza for dessert? You bet! 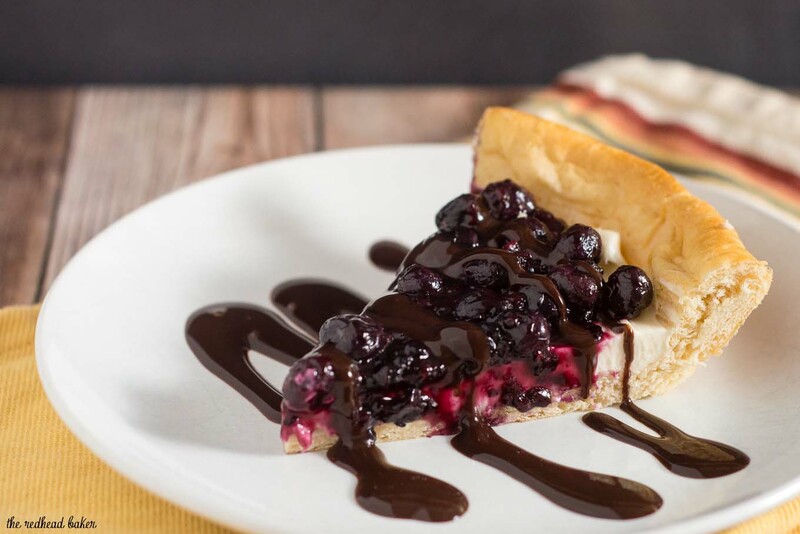 Cheesecake Pizza has crescent dough as the crust, topped with sweetened cream cheese, berry compote and chocolate sauce. October is National Pizza Month, so Sunday Supper is posting all about pizza, and I’m hosting! If I had to choose one food to eat for the rest of my life, it would be pizza. There are so many different toppings and ways to make pizza, I don’t think I could ever get tired of it! We have pizza just about every Friday night, sometimes homemade and sometimes takeout, so I could have posted about any number of topping combinations. But this time, I decided to be a little different, and post about dessert pizza. Never heard of dessert pizza? It’s just as fun as regular pizza! You can use a regular pizza, a sweetened pizza crust (adding sugar to the dough), or something completely different, like a giant cookie, or crescent dough. I went with crescent dough for my Cheesecake Pizza, which makes this kind of like a deep-dish pizza. The crescent dough is pre-baked in a pie plate, just like a pie crust, with tinfoil and pie weights or dried beans to prevent the dough from puffing up too much. 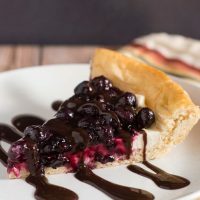 The baked crust is covered with sweetened cream cheese, but since there are no eggs, it doesn’t require further baking. 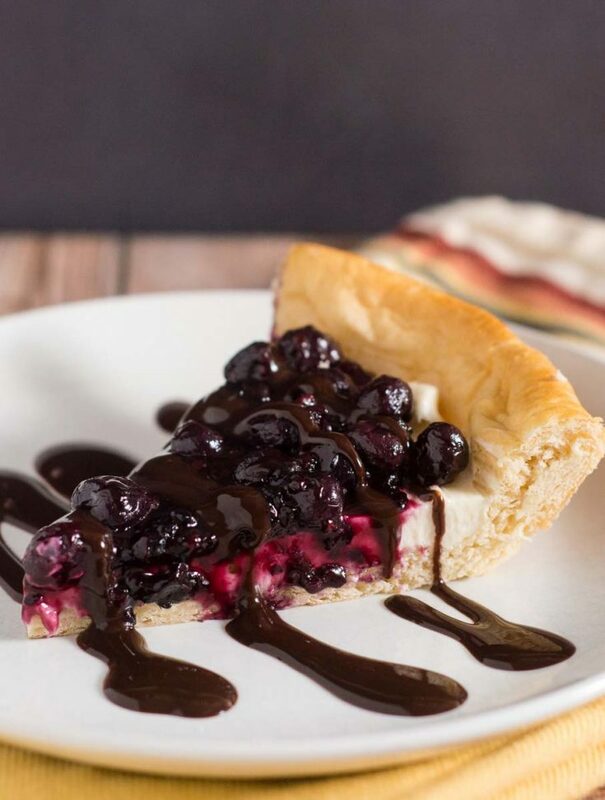 Once the sweetened cream cheese is chilled, it’s topped with fruit compote and chocolate and is ready to serve! 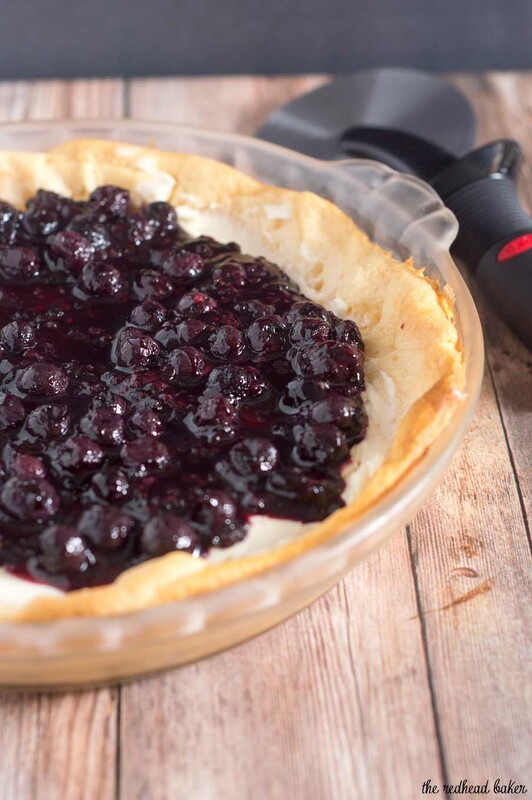 Once the baked crust is topped with the cream cheese, it can be covered and stored in the refrigerator for up to 24 hours. The fruit compote can also be made up to 24 hours in advance, and stored in an airtight container in the refrigerator as well. It’s the ideal make-ahead dessert! 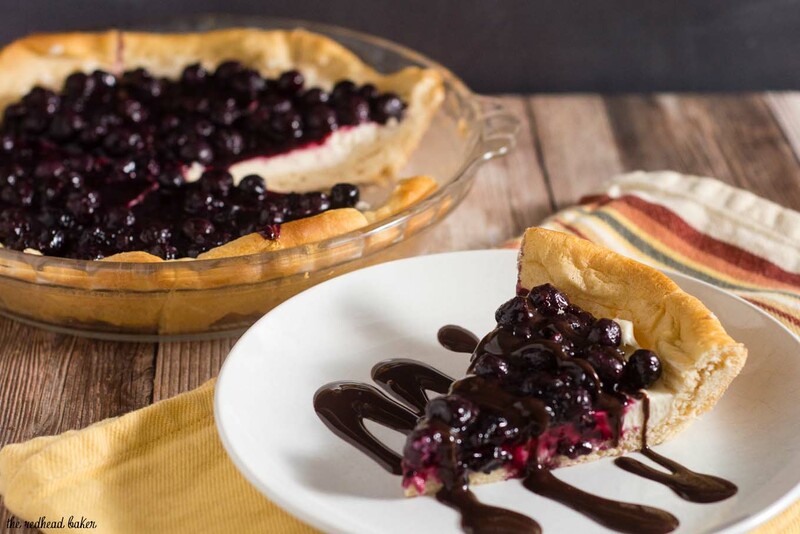 If you’re really in a pinch, you can use any fruit-flavor canned pie filling instead. 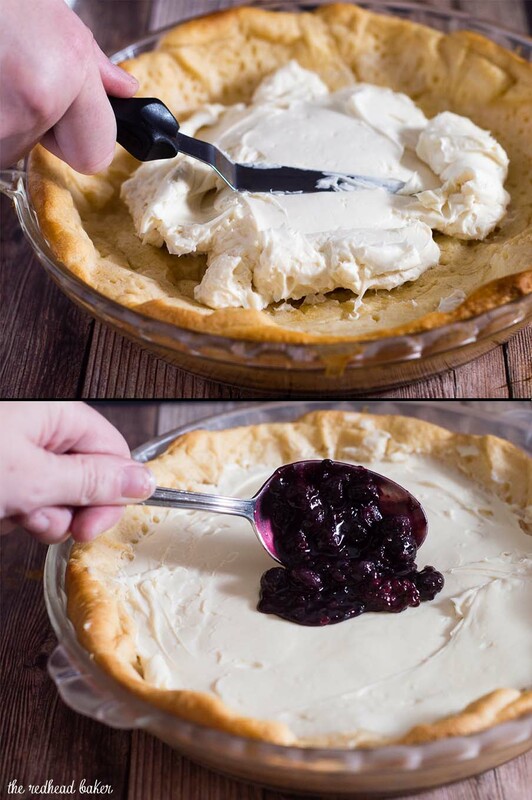 You can also use Cheesecake Pizza crust and filling as a base and mix up the toppings however you like. Instead of berries and chocolate sauce, use sauteed apples and caramel. Flavor the cream cheese with peanut butter, then top with chopped peanuts and chocolate sauce. Flavor the cream cheese with marshmallow fluff, and top with graham cracker crumbs, marshmallow bits and chocolate sauce! Heat oven to 375°F. Separate dough into 8 triangles. Place in ungreased 9-inch pie plate; press in bottom and 1/2-inch up the sides to form crust. Gently prick all over with the tines of a fork. Bake 14 to 17 minutes or until deep golden brown. Set aside to cool. While the crust is baking, melt the butter in a skillet over medium heat. Stir in the brown sugar and lemon juice until sugar is dissolved. Add the berries and cook, tossing gently (try to keep most of them from breaking up), until berries are warm and juices begin to be released, 2 to 3 minutes.Dissolve the cornstarch in the cold water, and add to the saucepan. Bring to a boil, and cook at a boil for 2 minutes. Remove the stove and allow to cool. If preparing ahead, transfer the cooled mixture to an airtight container and refrigerate until ready to use. In a mixing bowl, beat together the cream cheese, powdered sugar, vanilla extract and lemon zest. Spread the cream cheese mixture over the cooled crust. Spoon the berry mixture on top. Drizzle chocolate sauce over the pizza. Cut into 8 slices and serve. Discover more #SundaySupper Pizza recipes! 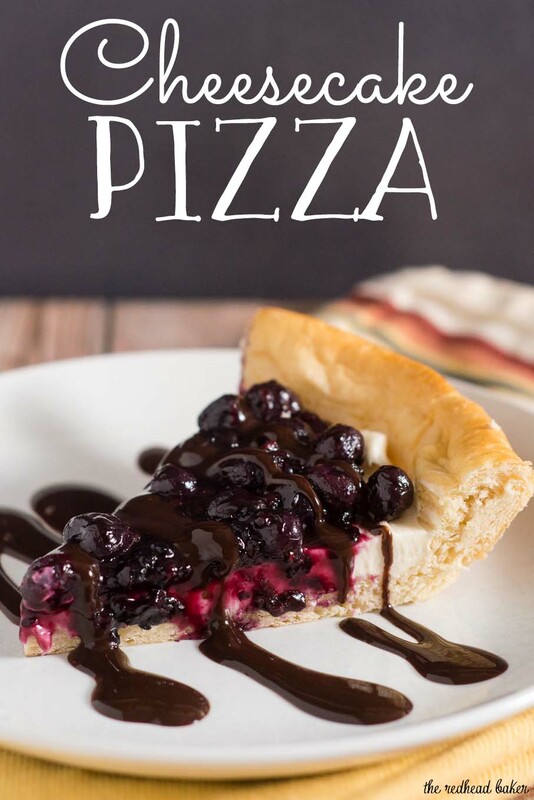 This sounds like a great dessert pizza! Sounds great to me! It looks delish!